St. Joseph’s students participate in clubs and camps! Good day from St. Joseph’s Indian School! This has been an interesting few days weather-wise. You’ve heard the statement ‘March comes in like a lion or a lamb and goes out the opposite.’ The addition of a leap year day kept that truth in place here at St. Joseph’s, since that was the day (not the 1st of March) that got the bad snow storm. The month ended on a wet and windy day which set the tone for more snow on April 1st, and that’s not a joke. One benefit is that the grass is turning green nicely. 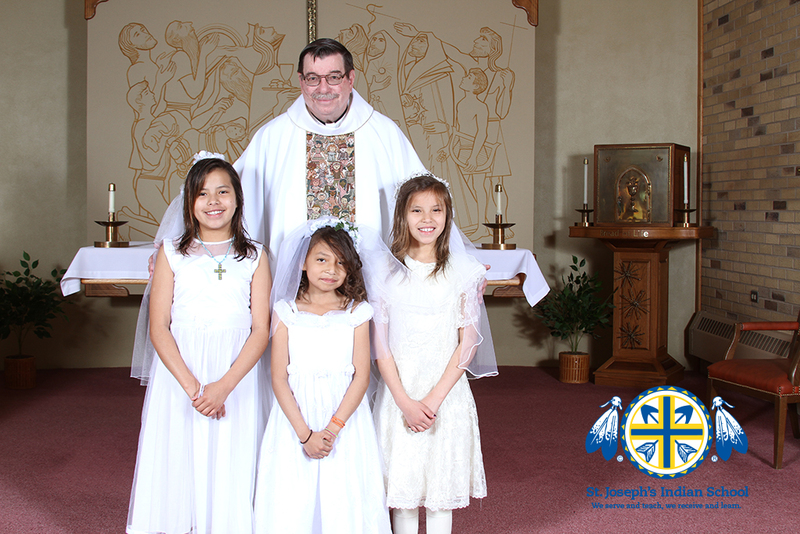 The big event of this past weekend was the reception of Sacraments for 24 of our students at Our Lady of the Sioux Chapel – four made their 1st Communion, 16 were Baptized and two made a Profession of Faith. 18 of these students also received the Sacrament of Confirmation. We were honored to have family and friends join the St. Joseph’s community in witnessing the reception of the Sacraments. As always, several of St. Joseph’s Houseparents, teachers and Family Service Counselors served as godparents or sponsors for the students. Author St. Joseph's Indian SchoolPosted on April 8, 2016 Categories Fr. Anthony, Guest BloggersTags Baptism, Chamberlain, communion, confirmation, Lakota, Native American, Our Lady of the Sioux, Our Lady of the Sioux chapel, South Dakota, St. Joseph's, St. Joseph's Indian School, staff, students6 Comments on St. Joseph’s students participate in clubs and camps! You’ve heard the saying, ‘the king is dead, long live the king,’ and we’ve seen an indication of it here at St. Joseph’s! St. Joseph’s staff participated in the annual Chili Cook Off yesterday. We have yearly contests to find the best chili and soup! Those entering need to make a good amount so the staff can come and taste the variety of entries. Staff make sure they come early so as not to miss out on the goodies! The various dishes were tasted by our judges and prizes were awarded. As our second semester gets under way, we’d like to update you on how our recent grads, alumni and scholarship recipients are doing! Kyron, JaTonne and Angela are back in class for the second semester. RJ is working here in Chamberlain at Sanford Hospital. Shawn is in Yankton looking for work. Cody, a 2014 grad, is back in class at University of South Dakota. Erica is discerning what her next step will be. What a weekend to be a child! What a weekend to be a child! Our students made the rounds trick-or-treating on campus Friday and then had the chance to dress up again on Halloween itself and make the rounds in Chamberlain. There were a wide variety of costumes and I had a hard time judging my favorites! The weather cooperated as well. Several of the high school homes made the trip to Sioux Falls, South Dakota to take part in haunted houses and scary corn mazes. On Friday, the National Honor Society students sponsored a dance for the 7th and 8th graders from St. Joseph’s and the Chamberlain community. The price of admission was a non-perishable food item to be donated to the local food pantry. 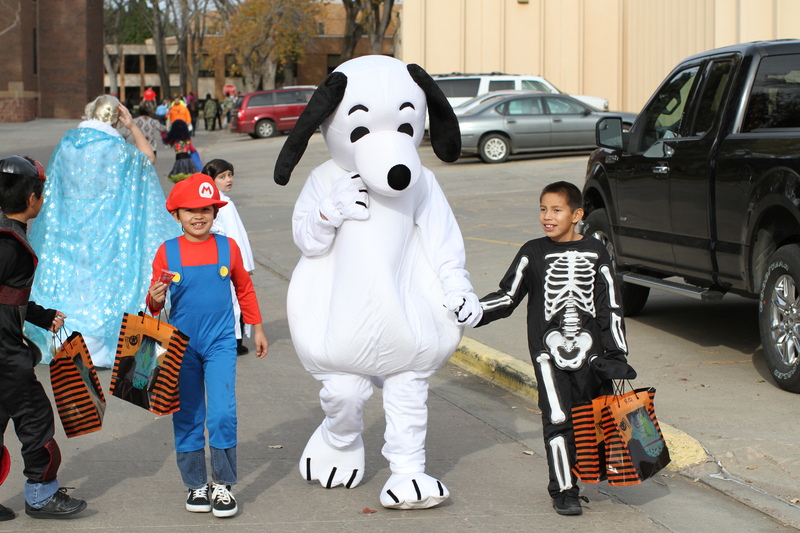 Our Lakota students enjoyed dressing up! St. Joseph’s National Honor Society has been busy helping local Special Olympics athletes during bowling practices and will be traveling with them this Friday to Aberdeen, South Dakota for the final bowling tournament of their season. Each of our St. Joseph’s homes are asked to do some sort of outreach every year. The Ambrose Home (boys in grades 1-3) decided to go to St. Joseph’s Catholic Church in Fort Thompson and help pass out coffee and treats after the Mass. They enjoyed the fellowship, as did the parishioners! 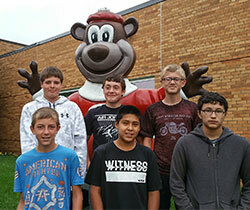 As the year continues to roll by, new sports and activities commence for the Lakota students to enjoy. The girls’ basketball season opens this week as we host PILC (Pierre Indian Learning Center) and then travel to Crow Creek later in the week. The intercity basketball program for 6th, 7th and 8th grade boys is also underway. St. Joseph’s students combine with Chamberlain area kids to learn the basics of basketball and get some experience on the court. Coaches from both St. Joseph’s and the Chamberlain school district are assisting. 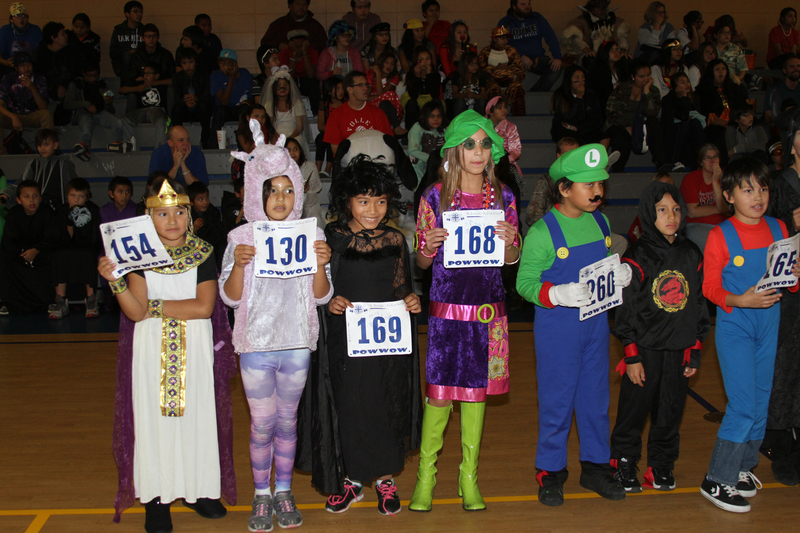 Our students participated in a costume contest! Other activities for our Lakota (Sioux) youth include martial arts, wrestling, archery and swimming lessons. Several of our older students are practicing their skills in Lakota Hand Games. You might remember that our hand games team took first place at the annual Lakota Nation Invitational last year. They are practicing twice a week for this year’s competition. We’ll keep you informed about how they do this year! At our Mass on All Saints Day at Our Lady of the Sioux Chapel, we had a tree at the front of the chapel decked out with red ribbons. These ribbons bear the names of family and friends who have passed away and are now walking the Red Road. It is our way of keeping them in prayer, asking the Great Spirit to have mercy on them and welcome them into the Heavenly Kingdom. We’ll have the tree up all month as we keep the dearly departed in mind. Hope you’ll have a wonderful month and that you did not overdo it on any Halloween candy you gathered. May God’s blessings continue to be with you, and thank you for your ongoing support of St. Joseph’s Indian School. Author St. Joseph's Indian SchoolPosted on November 3, 2015 Categories Fr. Steve's updatesTags Lakota, Lakota (Sioux), Lakota (Sioux) youth, Our Lady of the Sioux chapel, St. Joseph's, St. Joseph's campus, St. Joseph's Indian School, staff, students2 Comments on What a weekend to be a child! Greetings from St. Joseph’s Indian School. As I was driving home from the Chamberlain High School football game last Friday, I noticed several of the local motels had ‘no vacancy’ signs lit. I couldn’t figure out why so many people were in town …and then it hit me—pheasants. The South Dakota pheasant season opened Saturday at noon and the color of the day is now blaze orange. This is a very big source of income for the State of South Dakota and local guides. We offered a prayer at Sunday Mass asking the Great Spirit to keep all hunters safe. Saturday evening, St. Joseph’s sponsored a concert by Mr. Shane Heilman of The Psalms Project at the Our Lady of the Sioux Chapel on St. Joseph’s campus. The Psalms Project is a group of forty musicians who are working to put all 150 Psalms to music with artistic excellence, Scriptural integrity, and cultural relevance—a marriage of King David’s vision with modern music. Thus far, they have recorded the first 20 Psalms and are preparing to release their third album with Psalms 21-30. During the concert, Mr. Heilman talked about the project and explained the meaning of the Psalms he performed. Mr. Heilman also helped out with the music at our Sunday liturgy. To find out more about the project, you can visit their website, thepsalmsprojectband.com. Last week saw the end of the football and volleyball seasons here on campus. There is no downtime, however, for the Lakota students at St. Joseph’s! Our girls and boys began basketball, martial arts, gymnastics and archery practices this week. 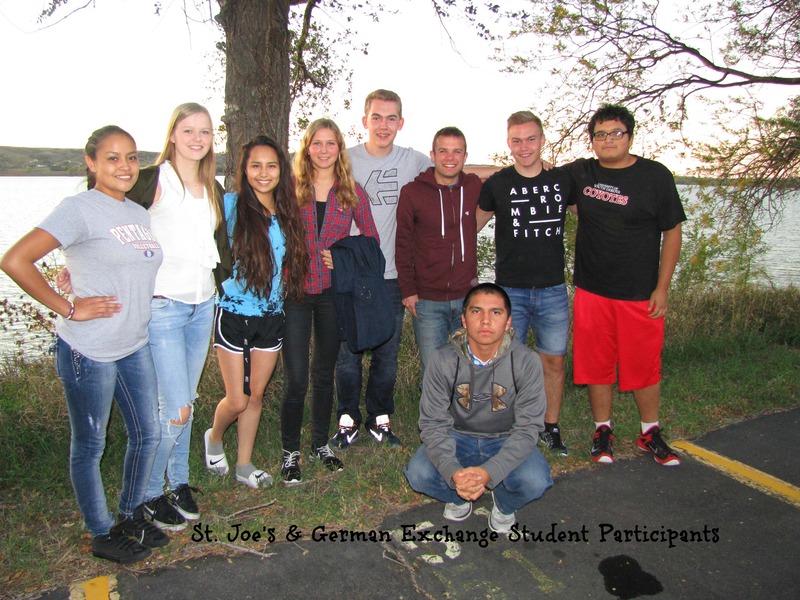 Our Lakota (Sioux) students enjoyed learning from our visitors through the German Exchange program. Our four German exchange students and their chaperone finished their visit to St. Joseph’s Indian School last week after attending a few days of school at Chamberlain High and then touring the Black Hills, the Badlands, Wall Drug and Mount Rushmore. They were also able to take part in a powwow in Rapid City on Native American Day (observed as Columbus Day elsewhere). They ended their stay with a presentation to our high school students about their hometowns, their families, their hobbies, what sports they like and their favorite foods. Our students hosted a farewell party at the end of the presentation complete with a cake shaped like a piece of luggage. Our guests stopped in Chicago for a few days to visit the SCJ’s college program for our seminarians before heading home. The visit was enjoyed by all. May each of you have a wonderful week as we see the beauty of nature continue to unfold with the changing of the leaves. May we be grateful for the beauty and continue to do our part in protecting Mother Earth. May God’s blessings be with you now and always. Fall is in the air at St. Joseph’s. Leaves are changing and the students are enjoying the fall days as the football season comes to an end. On Monday, when most of the country was celebrating Columbus Day, the State of South Dakota celebrated Native American Day. 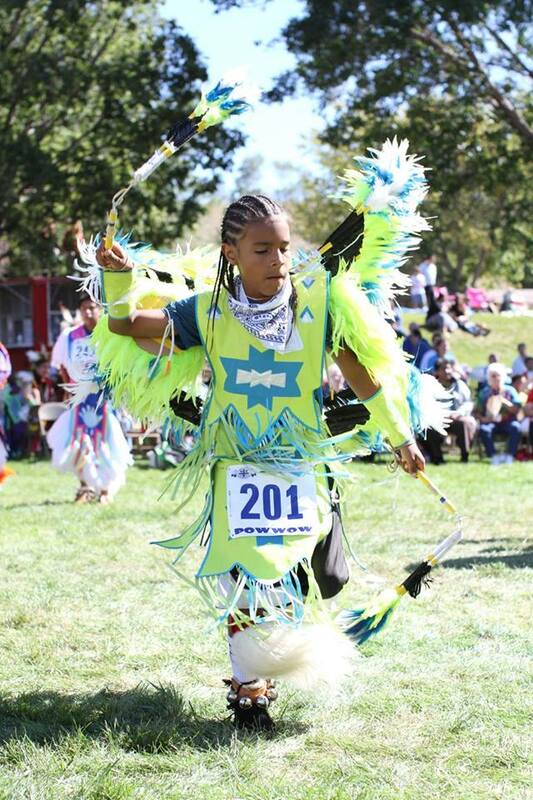 There was a large powwow in Rapid City on October 10 and a good number of our students participated in the event. They were wonderful representatives of St. Joseph’s! Monday also saw the start of the school’s second quarter. We started the day with a Prayer Service enhanced by Native American activities at Our Lady of the Sioux Chapel. The service began with the entrance of our powwow royalty accompanied by the Chalk Hill Singers’ drum group. Several students led us in the Four Direction prayer. There were also readings from the Gospel of Luke and Joseph Marshall III, a member of the Sicangu Lakota Tribe. Our artist in residence, V.R. Janis, made presentations in the classroom during the rest of the day. Our students learned a lot! This past Saturday was the 16th Annual River City Band Festival in downtown Chamberlain. Our 4th, 5th and 6th grade students helped carry banners in the parade. After the parade, the bands gathered at the local athletic field to perform their field shows. St. Joseph’s drum group, the Chalk Hill Singers presented the Lakota Flag Song after the National Anthem to begin the afternoon festivities. I believe this is their first public performance outside of a powwow setting — they did a fantastic job! Kyle, one of St. Joseph’s students, is the new Explorers Secretary! The local members of the Chamberlain Middle School Explorers elected their officers for the year recently and one of St. Joseph’s eighth graders, Kyle, was elected secretary. The Explorers are a service club for sixth thru eighth grade boys that meet every Thursday at 7:30 AM at Chamberlain Elementary School. This year seven St. Joseph’s students are taking part and four of them are new members. The group also travels to Pierre to visit the State Capital and meet the Governor. The year ends with a trip to a major league baseball game. Two of St. Joseph’s students, Ramez and Tayeden, had a great time meeting donors at the luncheons in the Dallas, TX area. After the luncheons, they had the chance to visit the Texas State Fair and take a VIP tour of AT&T stadium, the home of the Dallas Cowboys. They even had the chance to visit the Cowboys’ locker room and have their pictures taken in front of the locker of their favorite player, Dez Bryant. Last week saw the end of the golf season. Chamberlain High School’s team won multiple invitationals and had all members qualify for the state tournament. Out of the 16 teams that took part, the Cubs came in 8th. Danny, one of St. Joseph’s students, placed in the top 25 as a junior. We are excited to support him next year! Thank you for your generosity. YOU make everything we do possible. It’s a time of preparation here at St. Joseph’s! This past week, two SCJ visitors from India visited St. Joseph’s to tour our campus and the surrounding reservations. Fr. Michael and Fr. Dharma were escorted by Fr. Dominic Peluse, SCJ and his associate, Pam Milczarski, from the Priests of the Sacred Heart office in Hales Corners, Wisconsin. Our guests came to visit since they are in the process of setting up a fundraising office in India to raise financial support for the SCJ ministries there. They have been traveling around the Province to see how our various offices send out mailings and stay in touch with Benefactors. We began our Sacrament Classes this past Monday. Some of our students are preparing to receive all three of the Sacraments of Initiation—Baptism, 1st Communion and Confirmation! Our second graders who have already been baptized will prepare for 1st Communion. Some may even make a Profession of Faith and join the Church. Please keep these students in your prayers. Last year’s celebration of the Sacraments of Initiation was a success! During this year’s powwow, visitors and friends who attended were able to write prayer requests. St. Joseph’s staff and students will pray for each and every request throughout this school year. Currently, the requests have been placed before the statue of the Sacred Heart in our Blessed Sacrament chapel. When I make out the prayer list for each month, I’ll take some of the requests and add them to requests for prayer that come in over the year from other Benefactors. We are always happy to pray for any specific prayer request you may have since it is one way our students can say ‘thank you’ for your generosity. St. Joseph’s was also happy to welcome the members of our Parent Advisory Council who gathered on the Monday after the powwow. They gather regularly to review policy and offer suggestions so we can keep fine tuning the programs we have here at St. Joseph’s. As always, thank you for your kindness and generosity. We keep you in our prayers! Author St. Joseph's Indian SchoolPosted on October 6, 2015 Categories Fr. AnthonyTags Our Lady of the Sioux chapel, Priests of the Sacred Heart, St. Joseph's, St. Joseph's Indian School4 Comments on It’s a time of preparation here at St. Joseph’s! Greetings from St. Joseph’s Indian School! We have finally had some time to reflect on our 39th Annual Powwow. What a wonderful few days we had! The festivities began with a bus trip to the Crow Creek and Lower Brule Indian Reservations. I had a chance to meet with donors taking part in the tour to offer a prayer for safe travel before they hit the road. It seems that they all had a great time! On Thursday evening, St. Joseph’s Indian School had a Meet & Greet. Several staff members and students met with guests to explain the programs offered at St. Joseph’s and answer any questions our visitors had. We had two of our high school seniors and an alumnae who is currently working at St. Joseph’s share the impact our school has had on their lives. Friday morning began with the announcement of our powwow royalty–Eagle Staff bearer Treshawn; Junior Miss St. Joseph’s Aurelia; and Miss St. Joseph’s Frederika. As our students headed off to class, our guests enjoyed breakfast and tours of the Nagel Business Office to see how our mailings are prepared and how envelopes with donations are handled. From there, our donors and friends went to the Rec Center to make their own dreamcatcher and attend a demonstration of Native American children’s games. On Friday afternoon, guests were able to tour the school with some of our students as their tour guides. A great time was had by all; students really enjoyed getting to talk with people from all over the country. Over 400 guests and friends attended our Tiyospaye Banquet Friday evening. The highlight of the evening– besides the drawing for a star quilt– was the show of hands as to how many were attending their very first powwow. It seemed that 75-80% of the hands went up! We were so honored that they chose St. Joseph’s as the place to experience their first powwow. 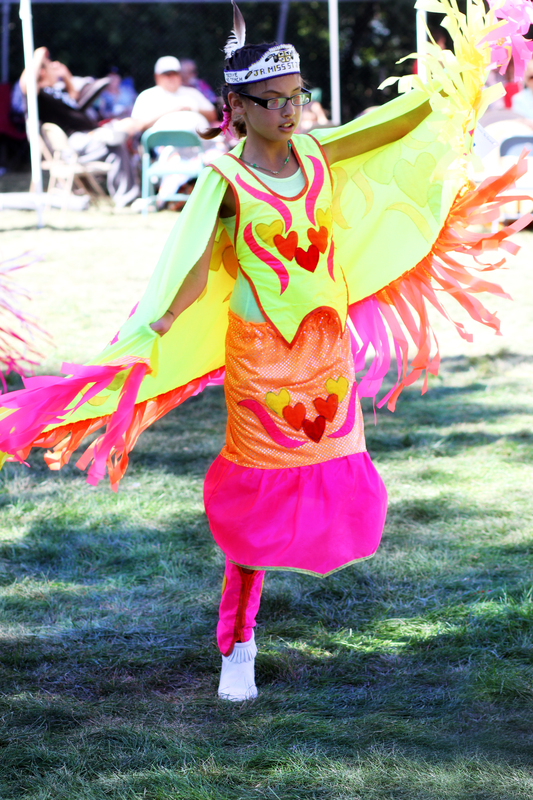 A St. Joseph’s student dances in the 39th Annual Powwow. homes on campus to see where our students live. Prior to the Grand Entry, several of our grass dancers came out to bless the powwow grounds. The Grand Entry began with a presentation of the colors, which all veterans present were invited to take part in. The veterans in attendance were followed by the royalty from other Native American tribes and entities in the area and the many dancers who had come to take part in the powwow. It is interesting to note that 102 St. Joseph’s students took part in the various dance categories, which enabled them to win some categories and place in others. The weather was wonderful, the colors magnificent and the dance moves intricate. Returning alumni were honored. Guests were invited to take part in tribal dances which are open to anyone in attendance. We culminated the day with Mass at Our Lady of the Sioux Chapel and a complimentary meal prior to announcing the winners of the dance contests and drum competition. As things wound down, there were many compliments and ‘ohs’ and ‘ahs’ over what had taken place that afternoon. We were honored to have so many guests, dancers, drum groups and staff all interacting in an enjoyable manner to make this one of the best powwows yet! If you would like to see some of what happened, you can take a look at the video one of our staff members put together. We were blessed to have great weather on Saturday and we thank you for your prayers to help make that possible. I’m sure that many of those attending this year are already looking ahead to 2016. As a quick reminder, St. Joseph’s annual powwow always takes place the third weekend in September. We look forward to many powwows in the future and hope you can join us! My name is Kelli and I am the new Development/Child Services Liaison here at St. Joseph’s Indian School. Although I may be a little biased, I think my job is one of the best jobs around! I get to spend time with the Lakota students and Child Services staff here at St. Joseph’s while still being in touch with our donors through our Facebook, Twitter, Google+ and Instagram pages. In one month, I have already gotten to participate in some pretty amazing things. On the first day of school for the Lakota students, our Lakota Studies teachers held a smudging ceremony outside of Our Lady of the Sioux chapel. Smudging souls is something that has been done for generations in tribal cultures. Smudging helps to rid a person or area of unwanted energies that aren’t helpful as well as bless new areas, items or places so that a fresh start is felt in the heart. It was a powerful experience to be present during the smudging ceremony. As students and staff walked through the smoke and washed it over their bodies, they emerged with focus, grace and excitement for the year ahead! Our 5th grade students enjoyed their time at the Air & Space Museum! Shortly after the beginning of the school year, I was invited to participate in STARBASE activities with our 5th grade students. STARBASE is a program that combines science, technology, engineering and math (STEM) with exciting experiments and hands-on activities to motivate students to explore these subjects as they continue their education. During one project, the students devised ways to protect an egg strapped into a model space shuttle before the shuttles were launched down a wire into a head-on collision. 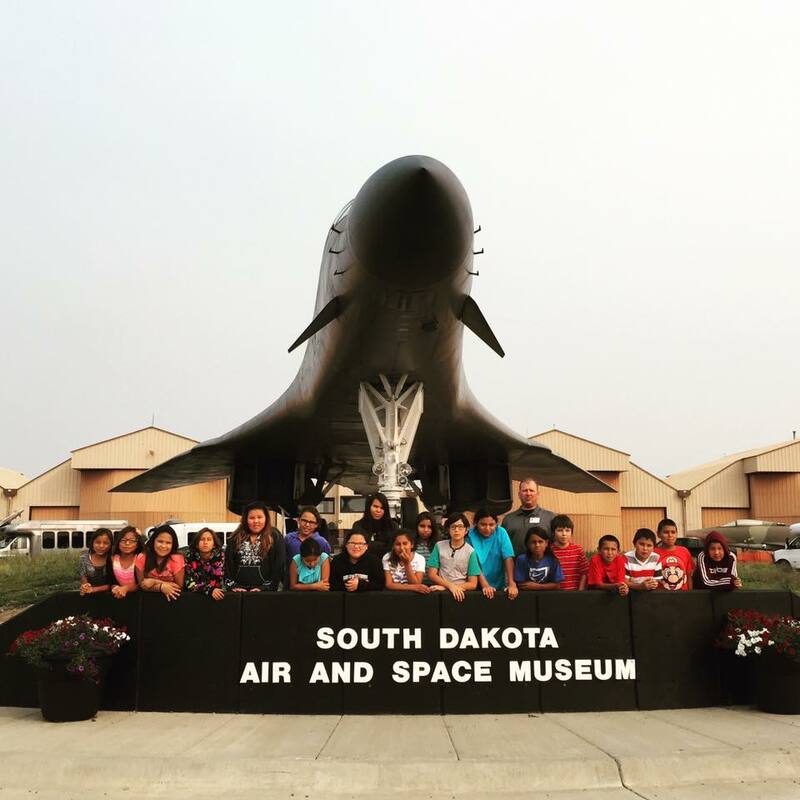 To culminate the week, the 5th graders took a field trip to Rapid City, South Dakota to visit the Air & Space Museum at Ellsworth Air Force Base. Although the air conditioner on our bus did not work on the way back home, a great time was had by all! In mid-August, St. Joseph’s Indian School started their fall sports practices. I have been enjoying spending my evenings working on volleyball skills with our 6-8th grade girls. Our first game is in about 10 days! On Tuesday, one of the 6th grade volleyball girls who has been having a little bit of a tough time adjusting asked me if I would join her during Thursday’s cross country practice. As a 6th grader, it takes a lot of courage to put yourself out there, so of course I said yes! Since I am not a runner, I would greatly appreciate your prayers and good thoughts today after school! Thank you for your generosity and support. You are truly making a difference in the lives of the Lakota students here in our care. They are becoming phenomenal young men and women because of YOU! This past Sunday, we held a Lakota Mass on St. Joseph’s campus to celebrate the arrival of our high school students, who started classes with Chamberlain High School on August 26. We currently have 50 students in the high school program; our enrollment campus-wide is 213 students. The local public school staff and teachers visited our Akta Lakota Museum & Cultural Center ahead of the start of their school year. The tour gave the teachers and staff an idea of what to expect when they interact with Native American students living in Chamberlain or coming in from the reservation. The experience also helped the staff to have a better understanding of our high school students’ backgrounds. A welcome back picnic for our staff and students was held at American Creek park along the Missouri River. There was laughter, kayaking, games, swimming, food and fun galore! Once the sun went down, the good times continued to roll with a bonfire and s’mores. 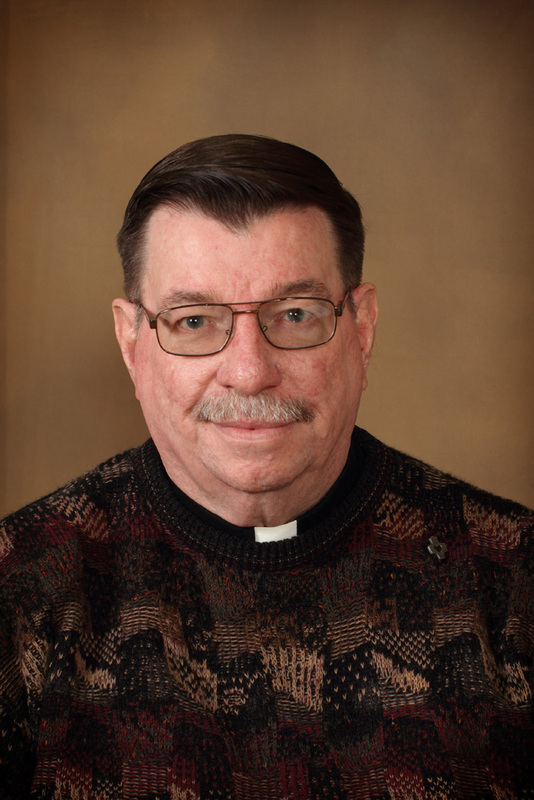 You may recall I mentioned that our religious community, the Priests of the Sacred Heart from Hales Corners, WI , held an election for a new Provincial and Council due to the election of our previous Provincial (and former Director of St. Joseph’s), Fr. Steve Huffstetter, SCJ, to the General Council in Rome. Our acting Provincial, Fr. Ed Kilianski, SCJ, was elected to take on the leadership role. He will be supported by Frs. Quang Nguyen, SCJ; Duy Nguyen, SCJ; Christianus Hendrik, SCJ; Jack Kurps, SCJ; and Br. Frank Presto, SCJ. We ask that you keep them in prayer that the Holy Spirit will guide and strengthen them as they lead the Province into the future. Our 2014 Jr. Miss St. Joseph’s dances at last year’s powwow. Now that we have rolled into September, we can officially say that our annual Powwow is close! Our students are practicing twice a week and our drum group, the Chalk Hills Singers, is also preparing for the event. The Chalk Hills Singers played at Mass on Sunday and 24 dancers took part in the entrance rite. Our 39th Annual Powwow festivities begin on Thursday, September 17 with guest registration, a reservation bus tour (pre-registration required), the powwow royalty crowning ceremony and a meet and greet with St. Joseph’s alumni. On Friday, guest registration will continue along with a complimentary breakfast, cultural activities, a tour of the school, cultural performances and our evening Tiyospaye Banquet (pre-registration required). Prior to the powwow on Saturday, there will be tours of students’ campus homes and an open house at Our Lady of the Sioux Chapel. Following the powwow, we will host Mass and provide a complimentary meal before prizes are awarded. If you would like additional information about our powwow or more information on planning your visit, please call 1-800-584-9200 or visit www.stjo.org/powwow. We would love to have you join us! May God continue to bless and reward you for your continued support and generosity to the Lakota (Sioux) children. Author St. Joseph's Indian SchoolPosted on September 1, 2015 Categories Fr. AnthonyTags Akta Lakota Museum, Akta Lakota Museum & Cultural Center, Lakota (Sioux), Native American, Our Lady of the Sioux chapel, reservation, St. Joseph's, St. Joseph's Indian School5 Comments on It’s Officially September! St. Joseph’s recently purchased a building in downtown Chamberlain! The new building will allow us to convert the existing Receiving building into a “one stop” disbursement center for non-food items used by St. Joseph’s students and staff, which is the biggest benefit the building will provide. This one-stop shop will include clothing for the students, household goods, personal care items, gifts, linen and all the supplies currently found in Central Storage. At this time, these items are stored in several locations on St. Joseph’s Indian School’s campus. With the added space and efficiency, the building used by Central Storage, the current thrift store and storage areas below Our Lady of the Sioux Chapel can be available for other uses. At this time we are out of storage room, and have little space for storage items that are seasonal or need to be saved for specific outreach programs, like the Bookmobile van, which distributes books to Indian reservation communities each summer. Items that are taken to missions on the Indian reservation are currently stored in the van or trailer until a full load is ready to go. This means the van and trailer are not available for other use between mission trips. With the new building, the boxes can be kept inside until a load is ready to go, then the van and trailer can be taken to the store, loaded and taken to the designated reservation or mission. We are also hoping that this will allow for more mission runs and for more efficient processing of donations. To keep costs down, maintenance staff from St. Joseph’s spent time doing demolition inside and outside of the new building in preparation for a contractor doing the majority of the remodel work. A general contractor will do the largest part of the project but, again to keep costs down, St. Joseph’s staff will do all of the electrical work and will co-ordinate with several local contractors on HVAC and plumbing.